Political players in Confederation Part I drive home the point that cultural superiority weakens when cash is on the table. The VideoCabaret creation relies on its trademark black box staging strategy for maximum mirth. Truth be told, there probably wouldn’t be a digital theatre magazine like Torontostage.com if it were not for theatre innovators such as VideoCabaret. They wanted something different, we demanded it. They thought outside the box, we couldn’t resist doing exactly the same. And while its 21-part cycle: The History of the Village of Small Huts goes to prove nation building doesn’t come without its growing pains, you don’t get to be 150 years old without having had all the right pieces in place to get things going. Off course, some of those holding the reins of power resisted opportunity but how hard could it really be to placate conflicting opinions for the greater good? 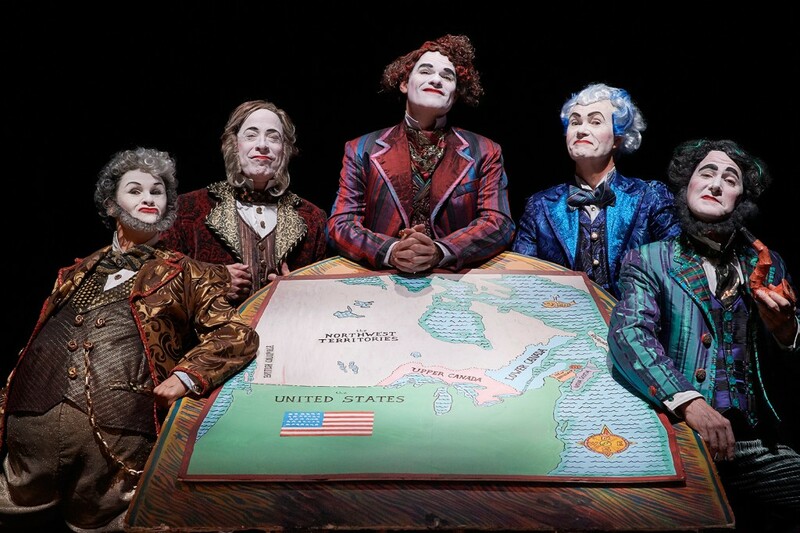 Intellectually absurd and hilariously facetious, VideoCabaret’s newest exercise in historical slumming is just what post-colonists need this summer to see how far Canada has really come. Not everything in these chronicles happened exactly as depicted but you’d be stunned at the factual accuracy of power hungry Sir John A. Macdonald’s (Richard Clarkin) quest to bring 4 million people under one governmental roof in Confederation Part I. Sir George-Etienne Cartier (Greg Campbell) looks out for Quebec’s best interest while Ontario vanguard George Brown (Richard Alan Campbell) proves to be a difficult partisan to get on board with a disenchanted Manitoba rabble-rouser named Louis Riel(Michaela Washburn) observing the matters from a distance. It’s smart, it’s silly, and it’s downright hard to believe a people’s story without filters could feel this good! But there’s a continued small problem of a criminal revolutionary confident he’s a prophet from God. Louis Riel doesn’t desire to profit from the situation but there a lot of money up grabs if he just agrees to stay away. Much easier said than done. Blood is shed securing a new treaty to clear the land and it’s doubtful anyone learns a single lesson from their irreverent actions. Michael Hollingsworth—a theatrical biographer with a constitution to please—lives by the mantra that a story isn’t worth telling if you can’t laugh out loud at it. His entertainment legacy is more enlightening than any text book taught in school and every bit honest in his objective in bringing truth to light. With more than 3,000 staging cues to trigger giggles throughout each offering, wigs that will make you look for a new hair stylist, and delightful period costumes that would land you that office promotion you’ve always longed for, Confederation Part I and II does not disappoint. Do the right thing and pledge allegiance to VideoCabaret this summer by securing a seat at the Young Centre. It’s not only your civil duty to do so, it’s a gut bustingly funny lecture you’ll not soon forget.